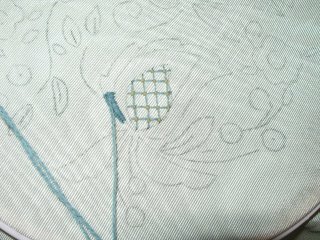 I also put a few stitches in on my crewel piece. I got Band of Brothers on DVD so we've been watching it this week so I didn't get as much done last night as I would have liked but any new stitches are good. The Appleton Crewel Wool isn't as bad to work with as I'd expected. The biggest dilema was how much to use, I'm used to linen and canvas where you have to use multiple threads for coverage, this is done with one strand. 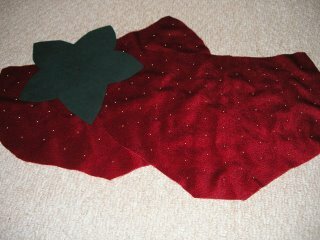 I also got a start on the insert for my red Lee purse yesterday. 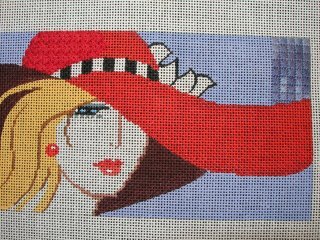 The background is a scotch stitch done with Needle Necessities overdyed thread and the hat is done in a trellis stitch with Soy Luster. Sue posted a comment asking about that after I posted about it on Tuesday and I completely forgot to post the info. The Pure Palette by Elements is what the tag has to say, 100% Soy Silk hand dyed. Its been great to work with on the bit I've gotten done on the hat, it tangles a bit as thread always does for me, but no knots which is fabulous. I'm the queen of tangle knots with thread as I work. Your strawberry is going to be adorable. What a change in the fabric with just a few beads! Ooooh, the hat and the background are looking great so far! I enjoy watching your needlepoint progress, as it's something I don't do myself.